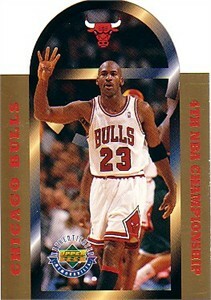 3 1/2 by 5 inch jumbo card issued by Upper Deck in 1996 to commemorate Michael Jordan and the Chicago Bulls winning their 4th NBA Championship. Individually numbered 21223 out of 25000 on the back. NrMt-Mt or better. ONLY ONE AVAILABLE FOR SALE.